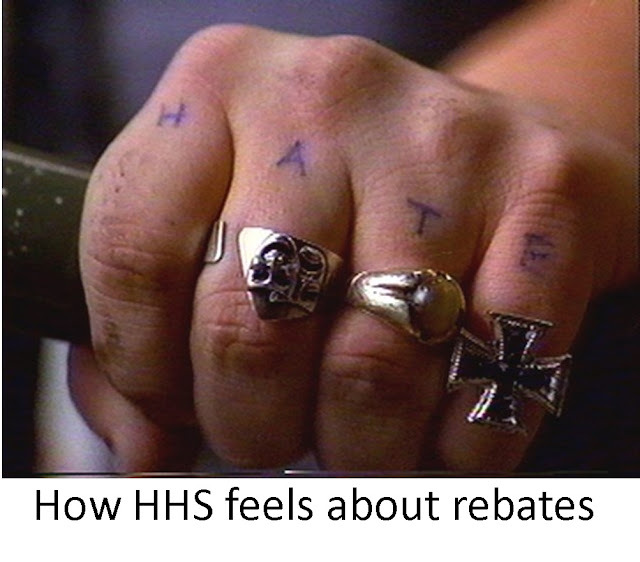 The Office of the Inspector General (OIG) of the Department of Health & Human Services (HHS) has proposed a rule that would dramatically alter the rebate system in federal programs. If the rule is finalized, rebates on prescription drugs paid by manufacturers to PBMs, Part D plans, and Medicaid managed care organizations will no longer receive safe harbor protection under the Anti-Kickback Statute (AKS). 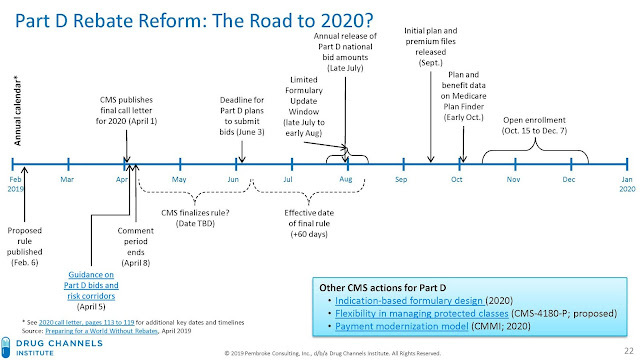 The chart below summarizes the regulatory timeline leading up to the 2020 plan year for the Medicare Part D program. I presented this slide during our webinar. The items above the timeline highlight selected dates from the official annual calendar for the Medicare Part D 2020 plan year. Many of these dates are established in statute and can’t be modified. April 1, 2019: CMS released its Final Call Letter for 2020. The dates discussed here come from pages 113 to 119 of the letter. 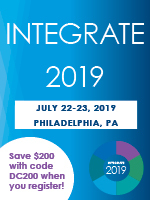 June 3, 2019: This is the deadline by which all plan sponsors must submit their 2020 bids, formularies, and other information. This date was determined by The Medicare Prescription Drug, Improvement, and Modernization Act (MMA) of 2003 (Public Law 108-173), which created the Part D program. Section 222 of the MMA establishes the date as “the first Monday in June” of each year after 2004. Notably, neither HHS nor CMS can modify this date. For a brief overview of the bidding process, I recommend MedPAC’s Part D payment system basics document. Late July 2019: CMS will release the 2020 Part D national average monthly bid amount, the Medicare Part D base beneficiary premium, the Part D regional low-income premium subsidy amounts, and other information. In recent years, this information was released on July 31. Late July to early August 2019: During a “Formulary Update Window,” CMS will permit plans to modify the formularies that were submitted on June 3. Note that the call letter includes incorrect dates for this window. CMS confirmed the late July-to-early August timing in response to my question during an April 8 conference call. CMS also stated that it did not intend to alter the timing. Mid-September to early October 2019: in September, CMS will publicly release two files: Drug and Health Plan Data and Landscape Source Files. These data files include detailed information about all Part D plans for the following year. The specific release dates for these files are not fixed. For the 2019 plan year, for example, the initial landscape file was released on September 16, 2018, and the final landscape files were released on October 12, 2018. We used these files for our analysis of preferred cost sharing pharmacy networks. October 7 to December 15 2019: During this nearly 10 week period, seniors will be able to review and select a plan for 2020. These dates are established in statute. The items below the chart’s timeline show selected dates that relate to the prospects for reform of rebates in the Medicare Part D program. February 6, 2019: The Federal Register officially published the proposed rebate rule. April 5, 2019: Seema Verma, the current CMS administrator, issued crucial Guidance Regarding Part D Bids. In this letter, CMS instructed plans to submit their 2020 Part D bids consistent with current law. In other words, plans should not modify their bids in anticipation of changes to the safe harbor treatment of rebates. This clarification ensures that all plans submit in a standardized fashion. It also discourages plans from submitting two bids: one under current law and one that contemplates changes included in the proposed rule. CMS also announced a demonstration project for 2020 and 2021 under which it will narrow the Part D risk corridors. (Plans face symmetric risk corridors that limit a plan’s overall profits and losses from offering a Medicare Part D plan.) This demonstration will occur only if the proposed rule is finalized. As I see it, this demonstration will encourage plans to continue participating in the Part D program—by protecting them from excessive financial variability. It will also encourage plans to keep their bids relatively stable if the rebate rule is finalized. For instance, a plan that is protected on the downside could submit a low bid as a strategy to gain market share. If the rule is not finalized, then the plan would face the prospect of larger-than-expected losses. Conversely, a plan that submits an excessively high bid may find that its plans would not meet certain tests for actuarial equivalence if the rule is not finalized. April 8, 2019: The 60-day comment period for the proposed rule ended on April 8. (It was actually 61 days, because the 60th day fell on a weekend.) You can brush up on your knowledge with this useful overview from the Office of the Federal Register. Alas, there’s no Schoolhouse Rock video called “I’m Just a Proposed Rule”. May to August, 2019: A federal agency can finalize a proposed rule at any point after a comment period ends. In practice, an agency must consider and respond to public comments. Any significant rule is required to have a 60-day delayed effective date. Given this timeline, it is therefore likely that the rule could be finalized but not effective prior to the June 3 deadline for bid submissions. We don’t know when the rule will be finalized. Even so, the timeline above shows little room for delay or error. 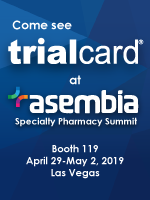 The calendar will also dictate how the rule gets implemented—especially which organizations plays the crucial role of administering chargeback discounts to pharmacies. I encourage you to read the entire text of Secretary Azar’s speech. The next few months will determine the future the U.S. drug channel. With just a jump to the left, and then a step to the right, we’ll be entering a world without rebates.